Creo (Formerly called Pro/ENGINEER), PTC's new family of design software, delivers breakthrough technologies that address unsolved 2D and 3D problems. Creo enables students to prepare for careers in 3D CAD design with the same award-winning ease-of-use, performance and functionality found in the standard Creo, used in 25,000 world-leading product development companies. Creo combines easy-to-use modules such as 2D drafting and 3D direct with powerful 3D parametric capabilities so you can bring your most creative ideas to life -- fast. The Academic Edition features the same advanced Creo technology used by hundreds of thousands of professionals worldwide. That means the skills you develop now will be immediately transferable to the professional world. Learning Creo prepares you for careers in the world's most successful companies. With 600,000+ seats of active software, Creo users are five times more likely to be hired by businesses with exciting opportunities for young engineers beginning their careers. Mathcad is engineering calculation software that drives innovation and offers significant personal productivity, process improvement and collaboration advantages for product development and engineering design projects. Unlike proprietary calculating tools and spreadsheets, Mathcad lets engineers design and document engineering calculations simultaneously with comprehensive applied math functionality and dynamic, unit-aware calculations. The skills you develop from using Mathcad Student Edition will be immediately transferable to the professional world! Mathcad Prime 2.0 does what spreadsheets, word processing and presentation software simply cannot do -- it easily displays calculations, text, data, and images in a single worksheet, enabling knowledge capture, data reuse and design verification. The result improved product quality with faster time-to-market and easier compliance with regulations. Mathcad's seamless integration with other best-in-class PTC products like Creo and Windchill increases productivity, improves process efficiency, and allows for better collaboration between individuals and teams. This is a simple, convenient way for you to learn how to use the Creo Parametric software, with helpful tips and techniques that can help you get your job done faster. Your library gives you instant, online access to over 40 different Creo Parametric & Pro/ENGINEER courses, so you can train at your own pace, whenever you have time. You get over 800 hours of training for about the same price as a text book. Available for students, faculty and staff. An easy way to learn new Mathcad modules and techniques, this eLearning library includes 22 training courses covering beginning through advanced topics on Mathcad. It is the fastest way ever to transform a Mathcad user of any skill level into a Mathcad "power user!" This version is for students only. Accessible 24X7 from any computer around the world, this eLearning Library offer courses around our Creo Elements/Direct product family. With over 200 hours of online training courses available at your fingertips, you can easily find the training you need and get back to work -- FAST. Available for students, faculty and staff. 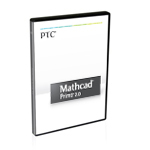 Check out this new exclusive bundle especially for students that includes Mathcad Prime 2.0 Student Edition software and Mathcad Student eLearning online training. Get the Mathcad skills now in demand by companies worldwide to achieve success in your professional engineering career. This version is for students only. Learn a 3D CAD solution that's easy, powerful, and highly used by companies all over the world. 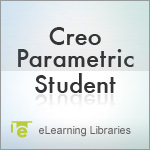 Check out this new exclusive bundle especially for students that includes Creo 2.0 Academic Edition software and Creo Parametric Student online training Library. Customize the way you learn 3D design and graduate with award-winning Creo skills. Available for students, faculty and staff.